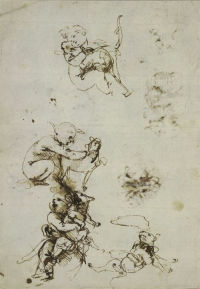 This sheet of rapid pen and ink sketches clearly based on observations of real life interactions between children and cats, illustrates Leonardo’s virtuoso handling of the technique – the economy of stroke, immediacy and expressive quality of the studies is unsurpassed either in Leonardo’s work, or in the drawings of other artists of the time. The drawing is one of a series of studies related to the theme of the Madonna and Child with a cat, on which Leonardo appears to have been working during the mid-to late 1470s. No painting of the subject by the artist has survived, and it is unclear as to whether the theme was ever painted by Leonardo. The reason for the cat in this drawing comes from the legend that a cat was born at the same time as Christ Child.